WASHINGTON — The President’s Commission on Combating Drug Addiction and the Opioid Crisis has issued its final report, which includes 56 recommendations to the Trump administration to help fight opioid abuse. President Donald Trump formed the presidential commission, chaired by New Jersey Gov. Chris Christie (R.), in a March 29 executive order as a way to assess drug addiction and abuse in the United States and identify actions that the federal government could take. The commission, which held its first meeting in June, on Wednesday voted on its final report of recommendations to the president. Just days earlier, Trump formally declared the opioid epidemic a national public health emergency, following through on a vow he made over the summer to do so. Topping the list of recommendations is the creation of a national multimedia campaign, including “aggressive television and social media outreach,” emphasizing the dangers of opioid painkillers and addiction to youth, removing the stigma of substance abuse and highlighting health risks associated with opioid use. The commission also called for better education about the hazards of opioid medications for middle school, high school, and college students, especially through trained professionals like nurses and counselors who can assess at-risk kids. Red tape has also been a problem in getting federal funding support more quickly and effectively to state governments, according Christie. To that end, the commission recommended that Congress and the administration block grant federal funding for opioid-related and SUD-related activities to the states. New Jersey Gov. 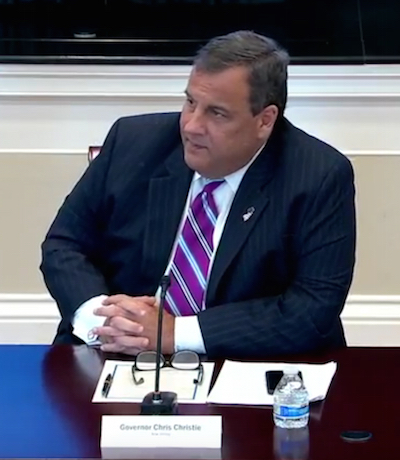 Chris Christie chaired the president’s opioid crisis commission since its formation in March. In what it called a “disturbing trend,” the commission cited federal health care reimbursement policies that incentivize the prescribing of opioids and limit access to nonaddictive treatments for pain as well as addiction treatment and medication-assisted treatment. In some cases, he added, nonaddictive pain medications are bundled in federal reimbursement policies so doctors and hospitals and doctors aren’t covered to prescribe non-opioid alternatives. “These types of policies, which the federal government can fix, are a significant deterrent to turning the tide on the health crisis we are facing. We urge you to order HHS to fix it,” he stated. • Give the Department of Labor more authority to regulate the health insurance industry. “The health insurers are not following the federal law requiring parity in the reimbursement for mental health and addiction. They must be held responsible,” Christie said. • Identify ways to reduce the supply of illicit opioids and bolster enforcement. This includes recognizing the proliferation of synthetic opioids such as fentanyl, stepping up penalties for trafficking of fentanyl and fentanyl analogues, and additional technologies and drug detection methods to intercept fentanyl before enters the country. Other members of the commission are Massachusetts Gov. Charlie Baker (R.), North Carolina Gov. Roy Cooper (D.), former congressman Patrick Kennedy (D., R.I.), Florida Attorney General Pam Bondi (R.) and Professor Bertha Madras of McLean Hospital and Harvard Medical School. “This tragedy has devastated Americans and America’s communities for far too long. The president has prioritized these crucial issues by declaring a nationwide public health emergency,” the White House said in a statement. “The President’s Commission on Combating Drug Addiction and the Opioid Crisis has submitted its final report, recommending how the federal government can address the drug addiction and opioid crisis. We are grateful for the commission’s extensive work since March and look forward to reviewing these recommendations as the entire Administration continues to work to lessen drug demand and the opioid crisis. The commission’s final report was applauded by pharmacy industry stakeholders. The National Community Pharmacists Association said the commission’s final report endorses several concepts that it supports, including prescriber education for controlled substances, expanded access to the overdose-reversing drug naloxone, greater availability to medication-assisted therapy, enhancing the scope and functionality of prescription drug monitoring programs, and more scrutiny and restrictions on certain controlled substances delivered through the mail.